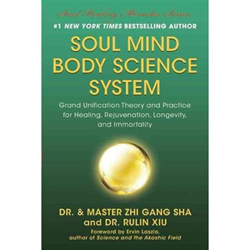 Dr. and Master Sha, a medical doctor, and Dr. Xiu, a scientist, share for the first time the scientific theories and fascinating relationships among matter, density, soul, and consciousness in new book, Soul Mind Body Science System. “The Soul Mind Body Science System introduces a scientific formula and practice to join soul, heart, mind, energy and matter as one,"
Are you fascinated by Sci Fi books and movies that depict parallel universes giving the characters the ability to tap into a re-engineered self or a more enlightened being? Does The Matrix movie or Issac Asimov’s "The End of Eternity" or JK Rowling’s "Harry Potter" make you wonder if alternate universes really do exist, and using one’s third eye could make them accessible to the present time? A ground-breaking new book by renowned miracle soul healer and New York Times bestselling author, Dr. and Master Zhi Gang Sha and physicist Dr. Rulin Xiu explains how Quantum Physics and the contemplation of the fundamental scientific laws of the universe provide proof that a fascinating relationship between “science” and “spirit” exists and can explain how and why soul healing miracles are genuine. In "Soul Mind Body Science System," Dr. and Master Sha, a medical doctor, and Dr. Xiu, a scientist, share for the first time the scientific theories and fascinating relationships among matter, density, soul, and consciousness. Throughout history, biblical and otherwise, there have been countless cases of “miracle” healings, unexplainable by modern science. Written for personal development enthusiasts, armchair scientists, Sci Fi geeks, professional scientists, and those interested in the possibilities for advanced human potential, Soul Mind Body Science System makes a significant contribution to the ongoing debate about the true nature of reality. In this book, co-author Dr. Rulin Xiu explains how our reality is both deterministic and random. Dr. Xiu explains how conscious actions and unconscious actions manifest possibilities for humans. She uses the laws of science to explain how human potential can be magnified by opening one’s mind to the possibilities. Dr. and Master Sha, creator of Soul Mind Body Medicine™, explains how the Soul Mind Body Science System book works along with the techniques and lessons from his acclaimed Soul Healing Miracles practices to create incredible blessings and self-healing practices that transform health, emotions, relationships, finances and any aspect of life. Dr. and Master Sha explains how the scientific-based Grand Unification Theory which includes the concept of “oneness” and how humanity can explore this potential to enhance their lives, be more productive, gain unlimited knowledge and do amazing things now. In a time when more people are looking to answers to life’s questions, Dr. and Master Sha is proving to be a popular choice. Dr. and Master Zhi Gang Sha is the world-renowned miracle soul healer. He has created thousands of soul healing miracles worldwide in the last ten years (http://www.youtube.com/zhigangsha). He is the founder of Soul Mind Body Medicine. He was trained as a conventional medical doctor in China and a doctor of traditional Chinese medicine in China and Canada. The founder of the Institute of Soul Healing and Enlightenment™ and the Love Peace Harmony Movement™, Dr. and Master Sha is a grandmaster of many ancient disciplines, including tai chi, qigong, feng shui, and the I Ching. Master Sha is also an expert in the most advanced cellular healing science now occurring in China. In the West, he is involved in breakthrough research on the effects of spirit on the human system. Dr. Sha was named Qigong Master of the Year at the Fifth World Congress on Qigong. In 2006, he was honored with the prestigious Martin Luther King, Jr. Commemorative Commission Award for his humanitarian efforts. An international bestselling author, Master Sha is author of ten books in the Soul Power Series published by Simon & Schuster (Atria Imprint), with each book reaching the New York Times bestselling list and four of them reaching #1. Master Sha’s Soul Healing Miracles book published in 2013 by BenBella was instant bestseller on USA Today and Wall Street Journal. His newest book, Soul Mind Body Science System will be launched in Sedona, Arizona during the Tao Retreats in November, 2014. For more information, visit http://drsha.com/SoulMindBodyScienceSystem. A theoretical physicist focused on string and grand unification theories, Dr. Rulin Xiu’s work was at a standstill until she was inspired and guided by Dr. and Master Sha to mathematically formulate soul, mind, heart, and consciousness. Using physics, she subsequently created a grand unification theory to unify soul, spirit, mind, heart, and consciousness with physical existence. In short, Dr. Rulin Xiu found a way to scientifically prove the existence of soul. Born and raised in China, Dr. Xiu received her doctorate degree from UC Berkeley in 1994 for her research on string theory and grand unification theory (GUT). She is also an entrepreneur, herbalist, singer, healer, avid gardener, and author. Her previous work includes the book Divine Love, and she hopes to inspire readers around the world to understanding of the importance of soul and knowledge of how to heal and revitalize this important cornerstone of our lives.